Endurance Gold Corporation (EDG -- TSX.V, "Endurance") is pleased to announce the first assay results from the 2016 drill program on its 100% optioned Elephant Mountain Gold Property (the "Property") in Alaska located on roads about 76 miles (123 kilometres) northwest of Fairbanks. As announced on September 27, 2016 three (3) diamond drill holes were completed on the South Zone and one diamond drill hole was completed on the North Zone for a total of 598 metres drilled. Complete assays for the 2016 drilling are still pending however assays results were prioritized for drill holes EL 16-14 A&B which intersected an altered zone with areas of massive stibnite and arsenopyrite at the South Zone Soil Anomaly. "As the first drill hole to test this unexplained target, we are extremely pleased with a discovery of encouraging average grades that include narrower intercepts exceeding 20 grams per tonne" commented Robert Boyd, President and CEO of Endurance. "The associated wide gold, arsenic, and antimony soil anomaly has a strike length in excess of one kilometre within a Cretaceous-aged intrusive complex similar to those that have yielded other large gold discoveries in Alaska and the Yukon. Despite this encouragement, this discovery has still not explained the width and extent of this soil anomaly, thus excellent exploration potential remains for this South Zone target. We look forward to additional results from this year's program and an active future for this project." Weighted average gold results for the mineralized zone in two closely spaced holes are 4.09 grams per tonnes (g/t) gold over 4.6 metres(m) and 3.87 g/t gold over 4.6 m. True width is currently unknown. The gold mineralization in EL16-14 A&B is related to a five metre wide zone of inter-layered diorite and syenomonzonite associated with pervasive pyrite-arsenopyrite calcite and silica replacement of the diorite layer. A massive stibnite (antimony sulphide) bearing fault fill appears to parallel or sub-parallel a contact between a diorite layer and the syenomonzonite and the associated high grade intercepts of 20.39 g/t and 24.9 g/t gold can be correlated with this contact in both drill holes. The structure that hosts the stibnite is currently interpreted to be a steeply dipping structural zone striking northwest parallel to the eastern margin of the South Zone soil anomaly. 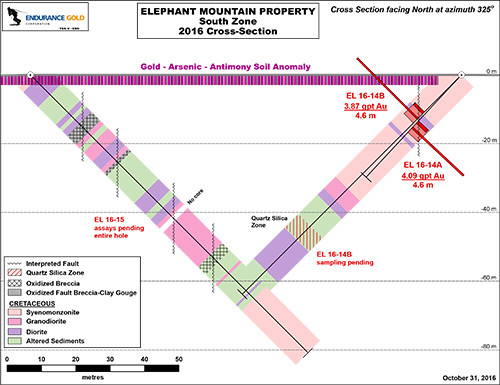 A cross section, plan map of the drill holes, and a core photograph of the drill intersections at the Elephant South Target are available at www.endurancegold.com. Drill holes EL 16-14 A&B (Azimuth 235 degrees, Dip -45 degrees) were drilled from the same setup on the eastern margin of the South Zone soil anomaly and are the same target hole that was re-drilled after EL 16-14A was lost and re-drilled as EL 16-14B. After re-establishing the hole, it was re-drilled past the same target at an interpreted slightly shallower angle. Thus, these two drill intersections are estimated to be less than three metres apart and both show the high grade gold in the same relative location within the 4.6 metre wide gold zone. For a summary of the other drill holes please see the company's release of September 27, 2016. The other South Zone drill hole EL 16-15 which underlies the western portion of the South Zone soil anomaly, has intersected a wide oxidized and disrupted zone which includes at least four areas of faulting, brecciation and clay gouge. Analytical results are pending for these other two drill holes which tested the South Zone soil anomaly, and the single hole drilled at the North Zone target. Complete analytical results of material sent to the laboratory are expected in November and December. Further sampling of drill holes may be completed after all initial results are received. The 100% optioned Elephant Mountain Property can be accessed by highway, road and all-terrane vehicle trails from Eureka, an historic and active placer gold mining camp in the Rampart-Manley Hot Springs district of Alaska. Endurance Gold Corporation is a company focused on the acquisition, exploration and development of highly prospective North American mineral properties with the potential to develop world-class deposits. The Company's projects include the Elephant Mountain Gold Property in Alaska and the Bandito Rare Earth-Niobium Property in the Yukon. The company also owns a 35.5% interest in the Pardo joint venture, a Precambrian-aged paleoplacer gold system. The company also an investment in a royalty together with significant shareholding in GFG Resources which controls the entire Rattlesnake Hills gold district, Wyoming. Robert T. Boyd, P.Geo. is a qualified person as defined in National Instrument 43-101 and supervised the compilation of the information forming the basis for this release. The drill intersections in this release may not represent the true width of the intersection. The split drill core samples from this program were analyzed at ALS Minerals using Au-AA23, Au-GRA21 (>10 g/t), and ME-MS61L. No assays for antimony or arsenic were completed on samples with values exceeding 10,000 ppm. Confirmation standards were inserted within sample shipments by Endurance as well as ALS Minerals inserted standards with each shipment analyzed.